Last week I began a writing group in my house. This has been a dream of mine for a long time. I love teaching and I also love the idea of a writing group that is a positive place to land. My desire with this group is that we will continue to encourage each other and invite others to join us. The group has already changed from a writing group with no focus to one where I will share my writing exercises as a way to inspire the rest of the group. The course I created is getting new life with this group and I am quickly learning the speed at which I can teach with only a handful of students. I will arrange exercises each week for 6 weeks and then we have a choice to share the exercise and then to share what we are working on as well. I give short homework which they can do fresh or apply to their current work. Today I sat down at Le Pain to work. My house needs so much attention these days so I left to work uninterrupted by my housekeeping guilt for at least two hours. I got so enthusiastic about my class tonight I planned the next two or three. I also wrote this blog post and roughed out two more. The only way I can handle the things I do this month is to get ahead when I can. 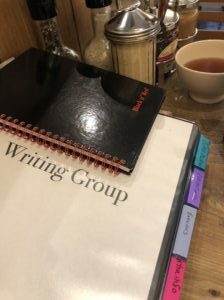 Getting ahead this week means preplanning the writing group, being ahead on the brunt of the work for my zombie class, writing blog posts for January and freeing up time to write my books. Side note: Looking through my writing notes I found a page I had written on plots. One of the entries is Man Vs Machine which I kept reading as Man Vs Machete. All I can say is that I spent a great deal of time last weekend considering weaponery and what I would choose to have on hand to fight zombies. Also in my life there is a machete my dad took off a pirate. An authors’s mind is never still for long. This is why I do yoga, and keep a journal, a daily to do list and a planner…That is another post altogether! What is your plan this week? Did you manage to stick to it? Everything sounds good for your writing class. Sounds like your having great fun! Hope you can post some anecdotes in the future.